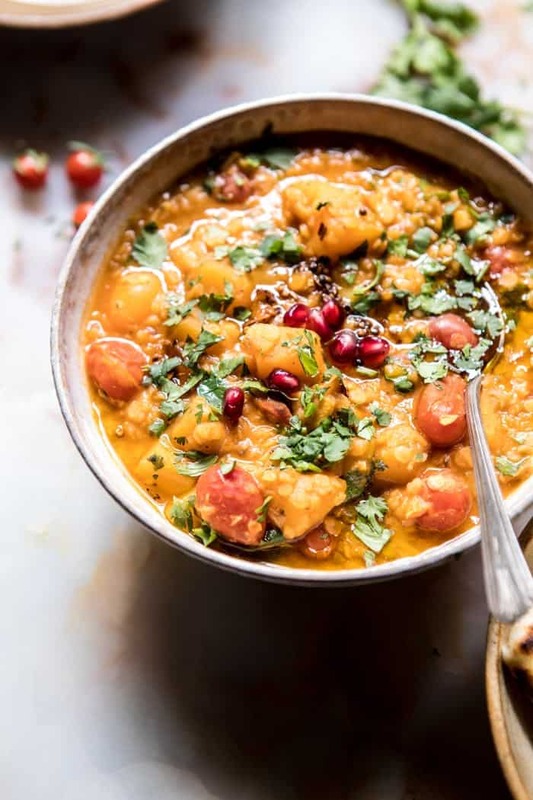 Harvest Tomato and Butternut Squash Dal. 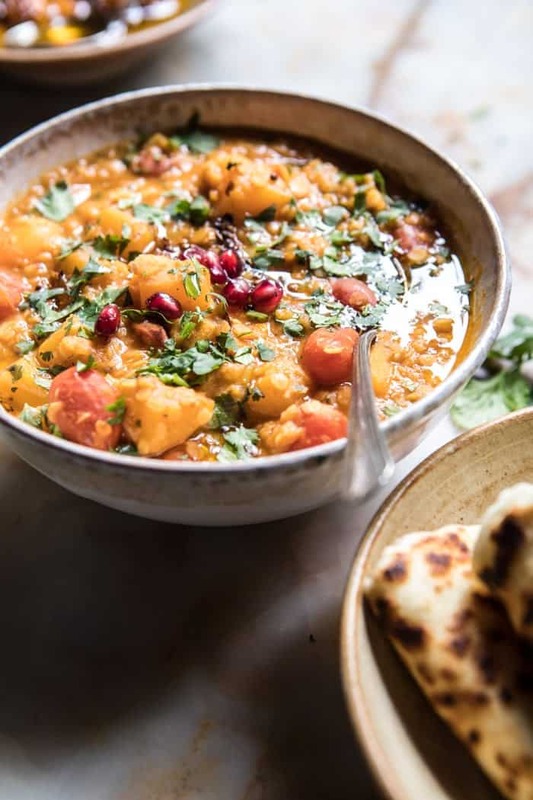 Slowly moving my way into fall recipes with this harvest tomato and butternut squash dal. With the official start of autumn being just over a week away, I can’t deny my excitement is through the roof…but you all know this, because I literally cannot stop talking about it. Sorry…but then really, I can’t help myself. This is one of those recipes that I’ve been planning for a while now. Way back at the beginning of the summer I really wanted to make an Indian dal, but the recipe just felt a little too warm and cozy for a summer dinner. Me, being me, I decided to wait until the recipe felt seasonally right, and now is the time to finally tell you all about it. It’s kind of hard to believe that this is my first dal recipe, but I’m pretty pumped about it. It was actually my cousin Abby who first gave me the idea to make a Dal, after returning from India this past winter. She raved about all the curries she’d had and said the Red Lentil Dal was especially delicious. 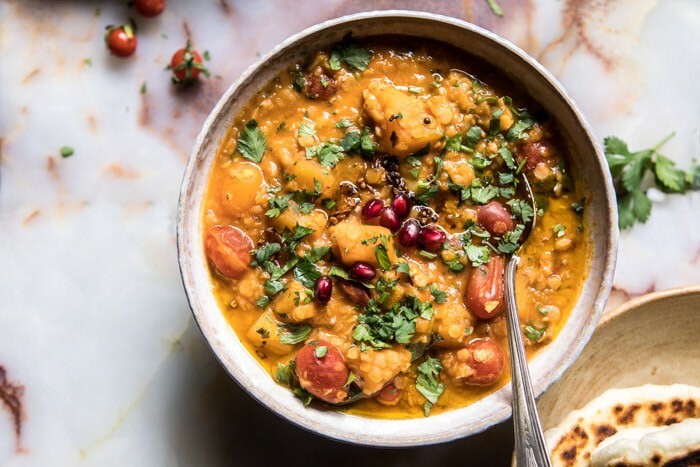 If you’re new to dal, it’s an Indian style red lentil curry. 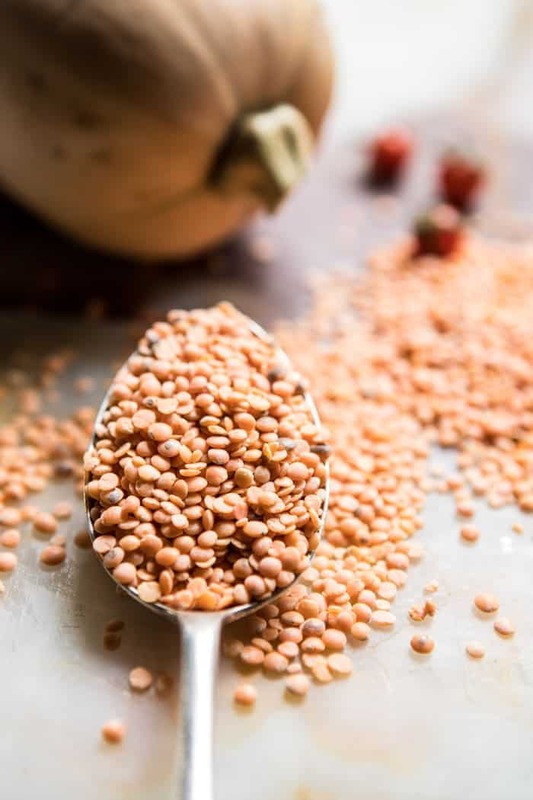 It can be made many different ways, but I believe using red lentils is the most traditional way. It’s a mix of slowly cooked lentils with curry style spices and finished with a drizzle of spicy oil drizzled over top. Most Dals are made with a mix of vegetables like onions, garlic, chilies, and or carrots, but I decided to use up the last of my cherry tomatoes and the very first of my butternut squash. It’s the perfect combo of summer meets autumn and trust me it is so good. The best part? 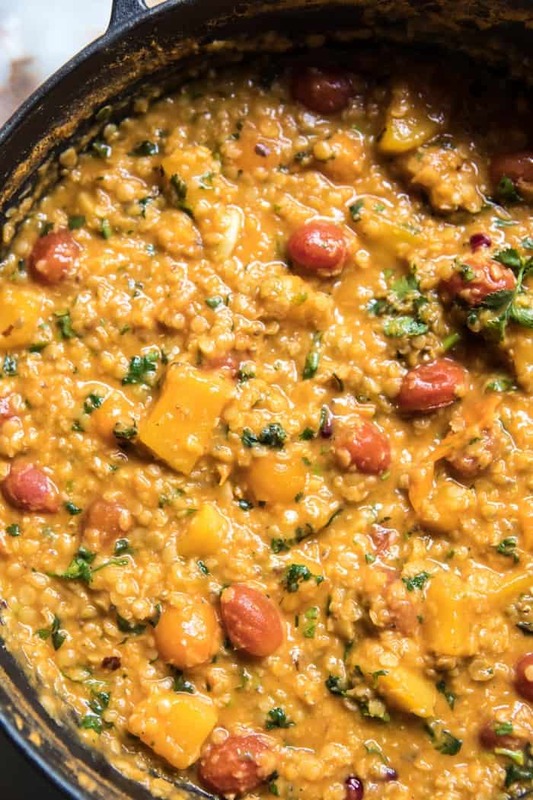 This dal is quick and easy to make. Everything gets mixed up in one pot and simmered on the stove for about thirty minutes. While that’s happening make a quick spicy tomato oil out of coconut oil, herbs, spices, and cherry tomatoes. Cook up some rice and warm some naan…very important. 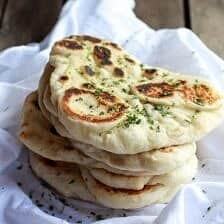 You need rice and naan with all curry style recipes. Obviously. Serve the dal over a bowl rice and then drizzle the spicy oil overtop. Add a little cilantro and maybe a few pomegranate arils, if you’re into pomegranates, which I totally am. And then DONE. Dinner in under an hour and it’s also completely vegan, which I only just now realized now. Cool. Cool. 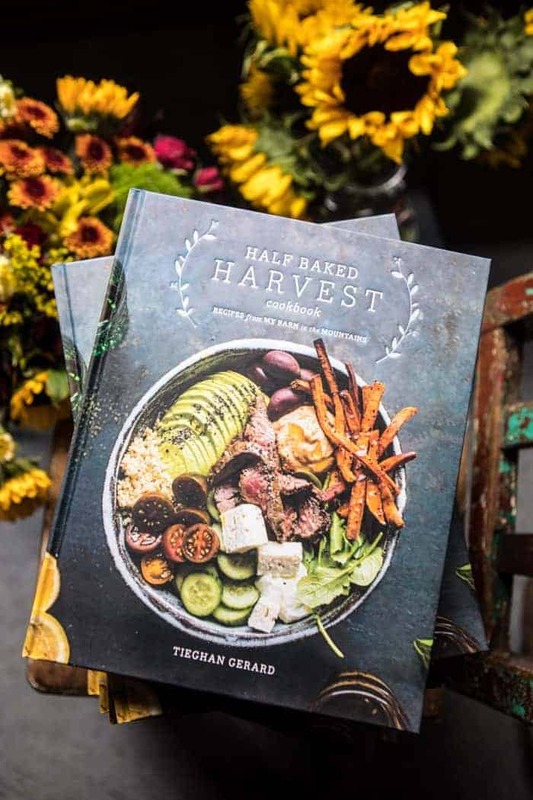 Speaking of things I cannot stop talking about…wow, everyone’s comments on yesterday’s post about the Half Baked Harvest cookbook have me smiling from ear to ear. Seeing all of you who ordered the book or went out and bought the book yesterday!? Ahh!! Just in shock, and filled with happiness and amazement. I really cannot believe it. Basically at this point in time I am just one giant ball of happy over here today. I can’t believe I’m even mentioning this, but my birthday is Friday and there could not have been a better early birthday present. Thank you all! If I could send you cookies or give you all hugs I honestly would be doing so right now. Since I can’t do that, be sure to continue to follow along with all the Instagram giveaways this week, and don’t forget to enter yesterday’s giveaway as well. Again, thank you guys so much for all of your support. It means the world to me and my little itty, bitty, HBH team. Hopefully more big things to come! 1. Heat the olive oil in a large pot over medium heat. When the oil shimmers, add the ginger and garlic. Cook until fragrant, about 2 minutes. Stir in the curry powder and red pepper flakes and cook another minute. Slowly add the water. Add the curry paste, lentils, butternut, and 1 cup tomatoes. Season generously with salt. Bring the mix to a boil over high heat, then reduce the heat to low, cover and simmer 20-30 minutes, until the lentils are soft and the tomatoes have burst. 2. Meanwhile, make the spiced oil. 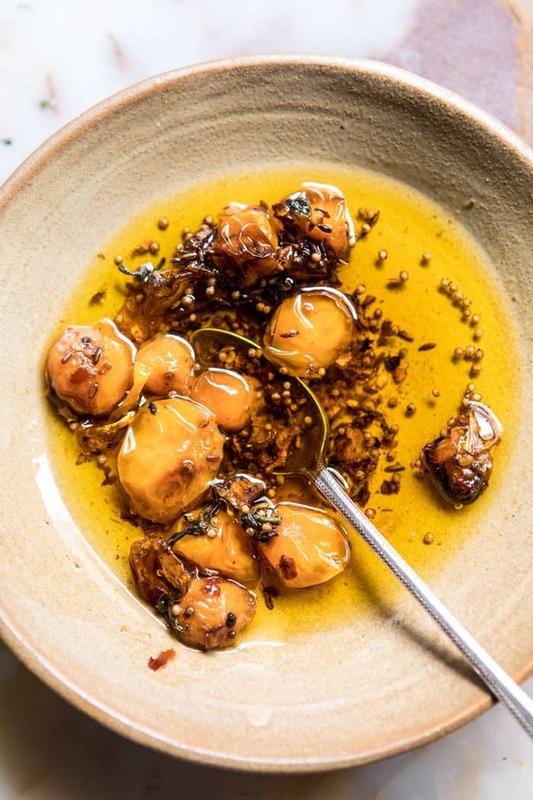 Heat the coconut oil, ginger, cumin, mustard seeds, red pepper flakes, and the remaining 1/2 cup of tomatoes in a medium skillet over medium heat. Cook until the spices are fragrant and the tomatoes have burst, about 10 minutes. Season with salt. 3. Remove the dal from the heat and stir in the cilantro. Taste and season with salt if needed. 4. To serve, spoon the dal over bowls of rice. Top as desired with cilantro, spiced oil, and pomegranates. Serve with Naan on the side. Enjoy! Maybe paired with a dessert from the cookbook! 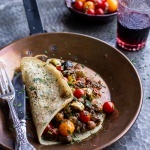 Rava Dosa (Indian Crepes) with Summer Squash + Tomato Chickpea Masala. 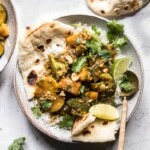 Simple Coconut Mango Chicken and Broccoli Curry. 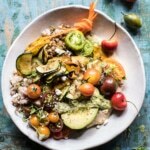 Summer Harvest Veggie and Avocado Quinoa Bowl. 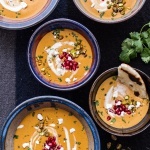 Moroccan Butternut Squash and Goat Cheese Soup w/Coconut Ginger Cream + Pistachios. I just made a dal last night for dinner! Great minds right?! PS can’t wait to get my book next week. We’re a bit behind in the UK, but it looks amazing. Congrats. Haha that is too great! Hope yours tasted amazing for ya 😊 Oh and I hope you LOVE the cookbook when you get it! Thank you! This is soooooo my kind of comfort food, I cook stuff like this a lot in Autumn and Winter. Perfect! I hope you love it Ruth! Thanks! I love your recipes, do at least one every week. Indian cuisine is my favourite so can’t wait to make this tomorrow. I like to make all my own sauces etc, so any recommendations for a recipe for the curry paste? Thanks – eagerly awaiting my pre-ordered copy of your recipe book! This recipe looks great. I have a vegan client that loves Indian food. I am going to suggest this to her on the next menu. Thank you! Awesome! I hope she likes it! Thanks Sherry! YUM ! 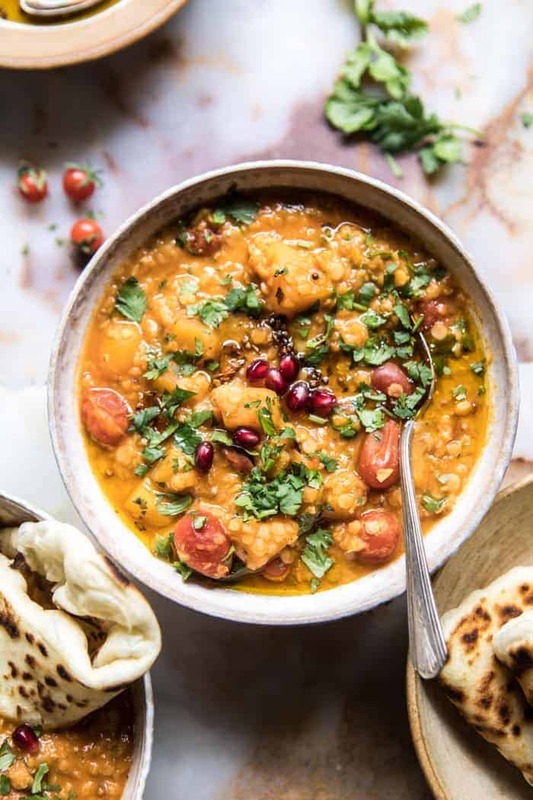 Never made dal, but I think I’ll try this recipe ! It looks so delish ! Also, your book ! OMG. I finished reading all the breakfast yesterday and couldn’t help myself and quickly browsed all the others recipe before having the time to fully read them. I can’t wait for the week-end so I can start planning my meal for next week exclusively from your book ! It’s a gem ! Ooo let me know how you like it! I am so thrilled you love the book Erika! Thank you so much!! I am from Pakistan, and used to this type of food, however you always have such a different take on things which makes it so interesting to try. I added Saffron to the recipe and it was amazing. That is amazing! I am so happy you enjoyed this recipe & the saffron was a nice addition! Thank you! Thank you so much! Yes it is the best present I could’ve asked for! 😊 Thanks Cindy! This is the perfect way to blend summer into fall and the color of the dahl is spot on autumn! As always, sounds and looks too good not to try! Received my copy of your book yesterday and it was such a great feeling to hold your words and photographs in my hands. It is such a vibrant cookbook, as I knew it would be based on your blog. Can’t wait to dig in to the recipes. Congratulations and happy early birthday! I have never heard of dal. HA!!! I hope you try it and love it Charlotte! Congratulations on your cookbook Tieghan! It is absolutely stunning and filled to the brim with declicious looking recipes I cannot wait to try! So happy for your success and what it may bring you. Cheers! Thank you so so much Denimo! I am so glad you like my recipes and I hope you continue to! Hi Tieghan from Texas! Your book was waiting on my front porch when I got home yesterday! My hubs and I opened it right up and looked at every single page. Compliments from the hubs on your beautiful photography! The book is gorgeous and I am under orders from the Mr. to cook my way though it. HaHa Early Happy Birthday wishes to you. 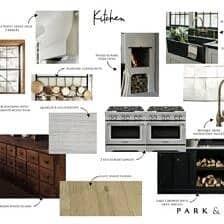 Congrats on the book, it is something very special and now has an honored spot on my kitchen cookbook bookshelf. Haha well I hope you both love every recipe! Thank you Carol! I just got your cookbook in the mail and opened it right up. I’m going to go ahead and call myself your biggest fan. It is absolutely wonderful and I honestly don’t know what to make first- I want it all! My three year old sat on the ground flipping through it and saying, “I want that, I want that, we’ll make that– Ooooo look at this! Yummmm!” The photography is incredible and the combinations look fantastic. Each chapter is as good as the last! I’m a stay- at- home Mom now that is SO lucky to get to get to stay home with the best kids, but since having kids and staying home, I don’t get to be as creative as I used to be. Your recipes have made me fall in love with cooking, feel creative again, and everyone loves them. Thank you so much! Awh, you do not know how happy it makes me that you are loving the cookbook and that it is getting you back into cooking! Maybe you and your kids (depending on age) could make a recipe together😊 Thanks so much Amy! Ah I hope you get it & love it!! Thank you Sarah! Love it and will be trying more asap! That is amazing!! Thank you so much Amy! Looks amazing! In a pinch, what would be the powdered spice equivalent for the ginger? You can just omit it. Hope you love this! Yum! I added 1/2 cup of pumpkin puree to thicken it up a bit. Oh, it’s divine. And….I am loving your cookbook! I am so glad you are loving this recipe & the book! Thank you! I am an Indian and Dal is a daily affiair. 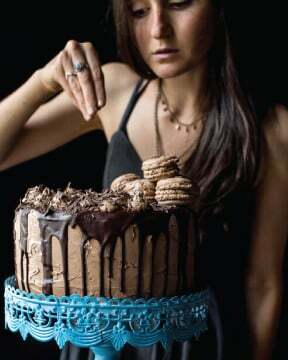 Yet I am reading this recipe and planning to make it now!! That is so awesome! I hope you love this recipe Anu! Thanks! Is there any substitute that would allow me to cut back on the oil? 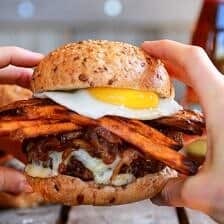 My husband has a restricted fat diet, but we both really want to try this!! Sure! I would just use what you feel comfortable using. The recipe will be great, the oil is mostly for topping the dish anyway. Please let me know if you have any other questions. Hope you love this! Hello! I’m looking forward to making this recipe. I do have one question as I’ve never cooked with butternut squash: does need to be cooked before you get the 2 cups of butter not squash out? I would love any pointers, thank you ! Is this okay to freeze?? Yes, this is great to freeze! This all looks so yummy! I have already made this three times. I love the amount of spice and the balance of savory, sweet, and tangy. 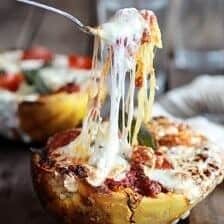 It’s the perfect fall meal! I made this as the vegetarian main dish in our Friendsgiving celebration – it was a big hit! I literally just put all of the ingredients for the main dish in a rice cooker, set it to cook, and it came out wonderfully! Will make again! I am so glad you liked this recipe! Thank you so much! 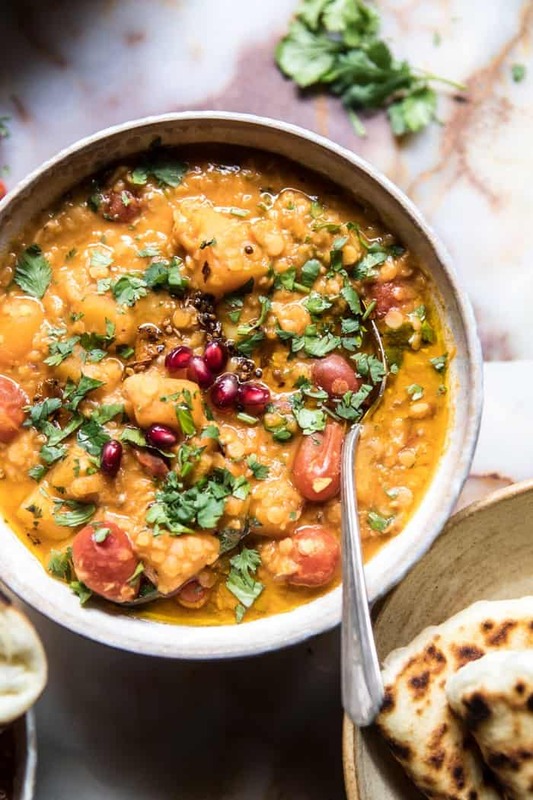 Butternut squash and lentils are my favorite combination together! They taste so hearty and are super filling. 😀 And I just had dal saag today! I might have to add butternut squash with it too! That is so great! Thank you Cassie! 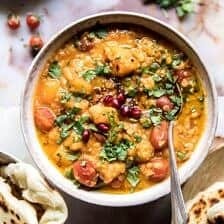 This dal is delicious! My favorite takeout place used to have an amazing dal and they took it off the menu. I’ve been missing it and this was a really close recipe! So good. Warm, comforting, and healthy. YUM! What is suggestion for the spiced oil after Step 3? Do we just pour that on top of the Dal or is it cooked together further? It’s super hot and humid outside but I made this anyway because I didn’t know what to do with all the cherry tomatoes from my garden. it was so delicious!! I will be making more – what a yummy lunch that was. All I needed was naan. I am so glad you loved this! Thank you so much Tricia! Not only was this my first time making a dish from this site, but also my first time as a South Asian Bengali making desi food. It turned out great in my opinion! Full of flavor and great consistency. I had it with white rice and cookied veggies. Thanks for the recipe! I am so glad you loved this Tasnim! Thank you! I’m just curious what kind of curry paste you use ?? Hi Briana! I use Thai kitchen curry paste. I hope you love this!